Creation: Appeared in July 1933 as a renumbering of the eastern piece of VA 515. It began at VA 172 at the intersection of Wythe Creek Rd and Poquoson Rd. 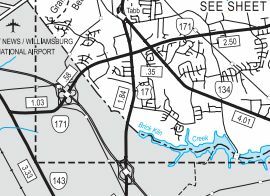 VA 171 went up Wythe Creek Rd, then west on Yorktown for a total distance of 1.3 miles. This is the 2nd VA 171. 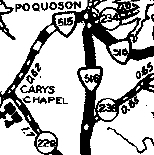 Adjustments: In May 1946 (CTB), VA 171 was extended west to US 17/VA 170 (now VA 134) Tabb, as an upgrade to SR 613. In March 1976 (CTB), VA 171 was removed from Yorktown Rd and Wythe Creek Rd in the City of Poquoson and put on its current route using Little Florida Rd, then replaced VA 172 out to Messick Pt. Yorktown Rd became unnumbered while the short Wythe Creek Rd piece of VA 171 became the northern end of VA 172. In April 1986 (CTB), VA 171 was moved to newly Built Victory Blvd between US 17 and Poquoson, leaving behind SR 706 Yorktown Rd. In 1999, VA 171 was extended west to I-64 over a road that had been opened as an extended Victory Blvd around 1992. In 2002, VA 171 was extended west to VA 143. 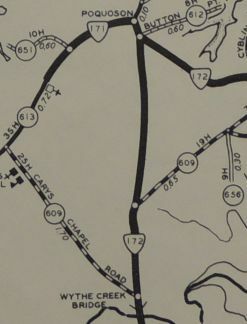 Note that CTB minutes in 1985 referred to the Oyster Point Rd extension from VA 143 to US 17 as part of VA 171, despite the designation not happening until much later. Improvements: paved upon desgination; Multilane west of VA 134 as those segments were made part of VA 171. 6 lanes btw I-64 and US 17; 4-lane ROW exists from VA 134 to VA 172. Posted: Fully posted except not in the City of Newport News (other than I-64 BGS). VA 171 is also not posted anywhere in Poquoson anymore. 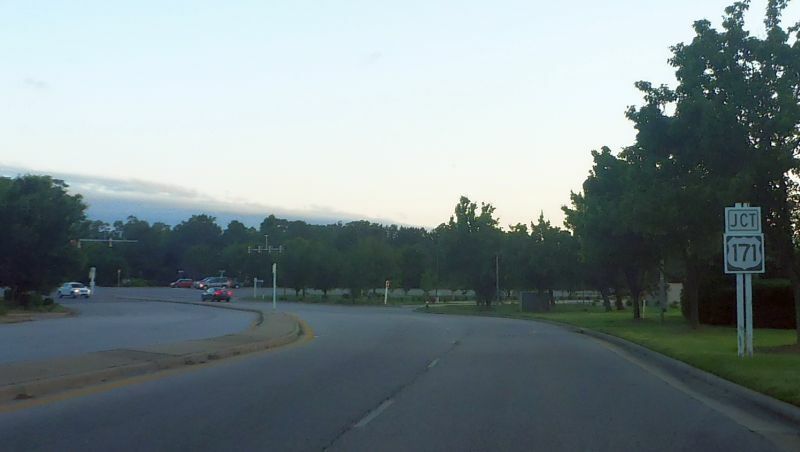 Thus there is an unmarked turn on VA 171 at Messick Rd (staying on the "through" road puts you at the original VA 172 endpoint at Armory Wharf). A cutout existed out near Messick Pt as late as 1993. An error US 171 sign exists just east of I-64 coming out of a shopping area. Comment: VA 171 provides direct link from I-64 to Poquoson, the least known of the Hampton Roads Cities. VA 171 #1: Appeared March 1923 (CTB) as new primary routing, running from VA 17 (now VA 42) Buffalo Gap to VA 33-39 (now US 11 Bus/250) Staunton. The east end was Beverley at Augusta Sts. In August 1928, VA 171 was renumbered as VA 810. Today it is part of VA 254.